The Vice President, Shri M. Venkaiah Naidu with the Students of Atharva Group of Institutes, in Mumbai on October 28, 2017. 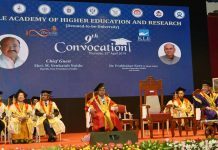 Mumbai: The Vice President of India, Shri M. Venkaiah Naidu has said that dream big, aim high and work hard to realize their ambitions and achieve success in the chosen professions. He was interacting with a group of students from Atharva Group of Institutes at the Raj Bhavan, in Mumbai today. The Vice President cited how late President, Dr. A.P.J. Abdul Kalam and the Prime Minister, Shri Narendra Modi, who came from humble background, rose to occupy the highest positions through sheer hard work, discipline and commitment. He further said that educational curricula in the fast-changing world must equip the students to find suitable employment or become self-employed. Merely acquiring degrees was not enough, education must enlighten and empower the youth and Indians are endowed with talent and this talent needs to be tapped through skill development, he added. The Vice President asked students to be well acquainted with the country’s culture, history and heritage. He further said that culture has nothing to do with religion as the former is way of life and the latter is way of worship. Unfortunately, some people are trying to mix both and Hindu is not a religion but a cultural connotation, he added. Shri Naidu also exhorted the students to be first proficient in their mother tongues first and subsequently learn as many languages, including English. “Due to the passion to learn English, we are forgetting our mother tongue. You can articulate in a better manner in mother tongue”, he told them. The Vice President said that he had advised all the state Governments to ensure that mother tongue was taught as a subject in schools if not as a medium of instruction. The Vice President deplored attempts to create dissensions in the name of religion, region and castes and termed such attempts as utter nonsense. He said that agriculture and industry were equally important for the development of the country. The Vice President, who is also the Chairman of the Rajya Sabha, expressed his concern over disruptions of Parliament and State Assemblies and underlined the need for constructive debates. “Debate, discuss and decide, but not disrupt”, he told lawmakers. Shri Naidu also said that pressure must be brought to bear on the political parties to pursue development agenda.